For the most heavy applications where the hose may be subjected to rough treatment and severe smoothness and cleanability of hose is of prime importance. This kind of smooth convoluted PTFE hose is the tailored solution for: the transport of acidic fluid, chemical agents, collant lines for gas and chlorine cilinders, transport of corrosive chemical food and pharmaceutical products for high temperature and pressure. 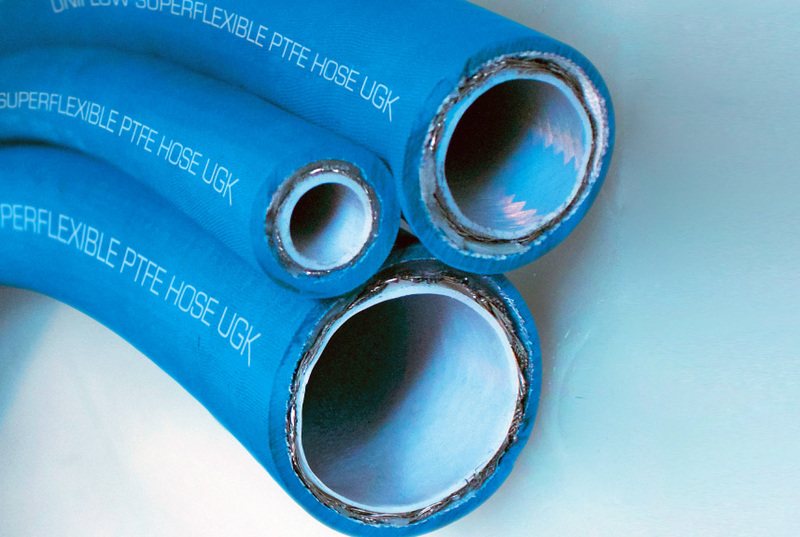 This smooth convoluted PTFE hose is extremely flexible, high resisten to the aging and to the crushing, low maintenance. The wide range of temperatures reachable by our hoses allow them to be the right solution to many technical problems in the industrial fi eld. As SS braided hose, smooth PTFE inside, assembly has a smooth finish, Silicone or EPDM external cover, vulcanized during the extrusion at temperature from 240 to 270 °C. Temperature from -40°C to 200 °C for Silicone, from -40°C to 180 °C for EPDM. Smooth PTFE innercore bonded to Silicone or EPDM. Multiple reinforcements.